Went above and beyond to make sure the project was completed on time. I wish them continued luck and success! Bill and team are rock stars! My car is 10 years old, but still in great mechanical shape. I was thinking about buying a newer model because I was just itching for a new(er) car. Problem is, the next used car I buy may be a lemon. So, I talked to Bill about wrapping my car and doing a color change. The quote he provided was really reasonable.His team did an awesome job. I posted the picture they gave me showing the before and after. Look for the silver BMW 645 Ci that they changed to Black Satin. The detail areas on this car really had to make it a difficult job, but they did awesome. Some car guys at work have told me what a great job it was!One other note to show you how honest they are as well. First of all; I was very satisfied with the price. Bill's quote was very detailed. It included the material, the adhesive, the labor and everything listed separately so there were no questions. I paid the deposit and they ordered the material. The wrap they ordered came with its own adhesive. So, he sends me a new invoice subtracting the original adhesive line item, cutting the final price I would owe him when done. These are the type of people that you want to do business with. I wish them continued luck and success! If I ever do this again or need any sign work; I'm coming back! Did an amazing job on our Big Top Jumpers truck wrap!! 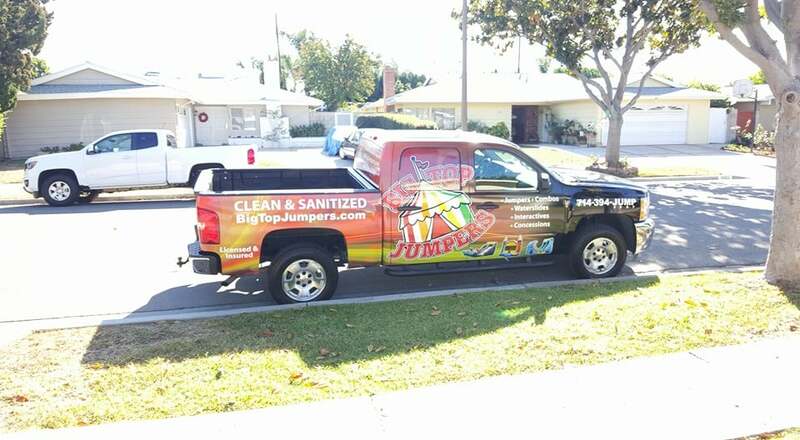 Black Parrot Sign Studio did an amazing job on our Big Top Jumpers truck wrap!! Everyone is professional and pleasant to deal with. I am certainly glad we found these guys for all our graphics needs. Craig absolutely knock it out of the park with his design on our wrap. I sent him some pics and select langue I wanted on the truck, but really did not have a clear vision for him to work off of. Or coarse I wanted something truly awesome, but it was ALL him. I am extremely happy with the entire process.I tried the team out with a small project initially, because I was tired of waiting for my projects to get done elsewhere. Bill really took care of us and made sure we were a priority in their workload. Make sure you check out our wrap on their pics section.On another note, I highly suggest a wrap. We always went with vinyl lettering, and it works ok; however, a wrap is the way to go. You cannot compare the visibility. If it's not in your budget, then a full perf window will certainly do the trick. I am amazed at the visibility through the windows! We can see way better through the perf, than the other vinyl lettering. It really is as if there is nothing there from the inside. I am extremely pleased with the lettering and the service provided at Black Parrot. I would highly recommend Black Parrot for any of your advertising needs. Truck came out better than I imagined. Needed a wrap for the company and all signs pointed to Black Parrot Sign Studio, emailed about 12 companies, they were the first to respond with the best price out of all 12. Not only that but it was a time crunch on 4th of July weekend, they were able to meet my unexpected deadline to attend a Charity event. Truck came out better than I imagined, customer service is by far the best out there, I feel bad for other wrap companies as this team has set the bar that no one will reach!Going back for two more wraps for my own company and the family business!Thank you!!! Efficient, on schedule, and the attention to detail was impressive. I was so pleased with the quality and service of Black Parrot, that I decided to work with them in designing and installing our truck wraps for our medium and large sized move in vans. This was not an easy task as the old wrap had faded and stuck to the side panels of the vans. Craig was a pleasure to work with in their design dept. and offering helpful suggestions along the way that really improved the end product. The installation was efficient, on schedule, and the attention to detail was impressive. I especially liked how they took the time to custom cut the wrap to fit over odd parts and knobs on the panel of the van. No shortcuts! Very pleased! I got my van back and was so impressed. Try finding a company to get back to you with artwork/placement work for a vehicle wrap. Then have them follow up with some kind of promptness. If you find it first try then you got very lucky. Save yourself some time and call this company. I tried 5 other companies until I hit Black Parrot. So glad I found this company, from Bill at the desk to Craig (The Wrapping King), Craig was so enthusiastic when I dropped my van off that I already knew I was in good hands and the wrap would come out great. Long story short, I got my van back and was so impressed. We have 3 or 4 more vans to go and I'm glad to give them my business. They do banners, signs and stickers too! Thanks Black Parrot! Time & cost more than reasonable. Absolutely love this business! They do a fantastic job on all their products. They don't rest until you are happy! I just ordered a few signs for my parking lot & they are working great! Time & cost more than reasonable. Will definitely be ordering more marketing products through them soon! Thanks Black Parrot! Couldn't be happier with the outcome!! Wow! What a pleasure working with the team at Black Parrot. Jonathan was so easy to work with and very responsive. We were looking for some ideas for behind the front desk at our gym. He took some of our ideas and helped come up with a fantastic metallic option with carved out logo. In addition we had them do a big vinyl for the opposite wall. Both came out great and at a great price. Couldn't be happier with the outcome!! Pretty much perfect from beginning to end. I work at Pure Water pools, and we bought a huge dump truck, that needed wrapping. After emailing a few places. Bill the owner of Black Parrot was the quickest to get back to me. Another place got to me, but asked that I measure the dump truck which was constantly on job sites. Translation: They didn't want to do any research to get me a quote. Bill simply asked me for the model of the truck and gave me a quote based on a design I sent him. Which was very handy for me since I'm busy, and the tuck was never close. That was already a good start. From there, the great customer service continued. He drove down to our office, since it was just a hop and a skip to Costa Mesa, and showed me color samples. The last thing that happened was pretty cool too. At it's final stages, Bill and Craig drove down to Laguna Niguel where the dump truck was on a job site and measured the truck for us! Yet another time he saved me hours in my work day! I honestly I can't say much more about my satisfaction in the customer service that Black Parrot showed us as a company. From point A to point B, they were on point the entire time. Oh yeah the truck was EXACTLY how I designed it ! Pretty much perfect from beginning to end. If you own a business and need work done, get a hold of them and you'll be in great hands! They ended up looking better than I would've hoped! Bill and his team at Black Parrot helped us with great looking logo's for our glass doors in my office and with huge banners for a convention. We needed the banners and of course I waited til the last minute to place my order. Bill was still able to get them to me before the deadline and they ended up looking better than I would've hoped! Bill and the team at Black Parrot Sign Studio went above and beyond the call of duty. We needed creative adhered to two F-350 pick-up trucks and one passenger van for a client on a tight schedule.The Black Parrot Sign Studio team was very understanding and helpful during a time-sensitive situation. They even went out of their way to pick up the van from the shop to finish the project on time.The finished product looked spectacular. We are very pleased and so is our client. We will be enlisting Black Parrot Sign Studio again and highly recommend their services. Highly recommend! Excellent service! Great ways to promote your business. Great Service and Staff. Highly recommended for all custom signs and car wraps for promotional use! They do beautiful work. The owners and staff are always friendly as well as professional. The place for any and all sign & design needs! THE place for any and all sign & design needs! I don't trust my brand to anyone else! Best signage studio around! Great staff, high level of skills, fair pricing. I highly recommend Black Parrot Studio. Needed banners for youth group project for LA County Sheriff's Department. Black Parrot Signs gave me a great price, excellent art quality and quick delivery. I highly recommend them!! Ok, so I have been using this company over the past 2 years, amazing work, excellent quality and a fantastic art department. Thank you for all you have done for me and my events that I have done. You guys rock! Great work and friendly staff. I highly recommend using Black Parrot Custom Signs & Wraps! The clarity and colors are amazing. Fast, friendly, reliable and the best quality banner we have ever had!!! The clarity and colors are amazing. Bill at Black Parrot took care of my window and door signs, they both look great and I would refer him to anyone I know in need of signs, auto wraps, etc. Thank you Bill! I was in the market for a couple retractable sing/banners and also a magnetic sign for my car to promote my business! I called Bill from Black Parrot, after a referral from a friend, and he got right back to me with options and pricing! Great customer service and very fair, reasonable prices! I will be referring Black Parrot to everyone I know! Black Parrot did a Soccer team banner for my son's team. It turned out perfect. They are professional and on time. I definitely will be using them in the future. Bill went the extra mile to make sure my new van wrap was exactly what I wanted. We couldn't be more pleased with the quality of workmanship, professionalism and the final wrap product. We started getting calls for pool work the very first week we put the new Mercedes Sprinter with new wrap on the streets. Before you call anyone else call Black Parrot. Black Parrot is amazing.. If you are looking for your car or truck to have a wrap, or have a sign made up for a booth, convention, sports team or whatever you need this is the place. They listen, the quality is fantastic and they get the done. Before you call anyone else call Black Parrot. I highly recommend them. I recently called Bill at Black Parrot about wrapping my car. He found the appropriate information for my car and emailed me a quote. His price was great! I would recommend Bill to anybody who is looking for a sign or vehicle wrap. 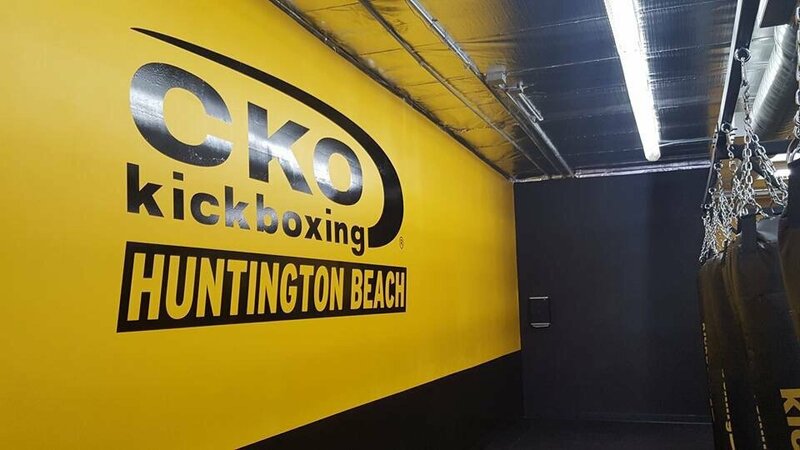 Another great experience using Black Parrot Sign Studio in Tustin. The service is phenomenal. We have used Bill and his team for some more projects and everything continues to be the best quality. More projects to come. Keep up the great work!! I recently got my Jeep Wrangler wrapped by the crew at Black Parrot. They did an outstanding job and I couldn't be happier. I had an orange, 4 door hard top and decided to get it wrapped in a matte gray. Even with wrapping over such a bright color, the work was so detailed oriented...you can't see the orange at all. They took the time to disassemble the Jeep in order to get the best possible job done. Throughout the process Bill took pictures and sent them to me so I could see the progress. The wrap job looked so good, I decided I needed to get new fenders and bumpers to finish it off! I couldn't be happier. The team at Black Parrot are on point.... They did a great job on our trucks and our reception signage.... Good job guys and I'm sure we will be in touch again soon! Black Parrot Sign Studio absolutely has outstanding customer service!!! They are extremely professional, friendly and helpful. They did an exceptional job with our reception signage. Their work is just awesome! There's no way you could go wrong with them! Bill and Craig really do the best job there is out there. I worked with Bill and Craig for a large project that took a couple of weeks. Throughout the whole process, their top concern and priority was that we would be happy with the results. They went above and beyond their ways in finding the right material, working with us on the graphics, printing everything, and setting up the final results at their studio so we could make sure everything worked out properly. I could not hesitate to recommend working with Bill and his team on anything you need to be printed - there's no way you could go wrong with them! Plus they're super friendly and fun to work with! They truly care about the quality of their work. Absolutely amazed and blow away by the work that Bill, Craig and their team did on our catering van! They truly care about the quality of their work. From a business owner with multiple restaurants, they have a made me a life long customer. THANK YOU FOR EVERYTHING! Provided us with realistic mock-ups and then very quickly printed and installed the graphics. I recently brought 3 of our vehicles to Black Parrot Signs to have graphics printed and installed; one van, a small box truck and a large box truck. We were on a tight schedule and needed a quick turn-around. The team at Black Parrot worked with us on the design, provided us with realistic mock-ups and then very quickly printed and installed the graphics. The trucks turned out great. We were extremely pleased with the whole process and recommend the team at Black Parrot to anyone looking for high-quality vehicle graphics. Super fast turn around time, quality of the banners and art work blew our expectations away. He did solid work in record time. Black Parrot Sign Studio came through for me with great work, a very reasonable price and excellent customer service. A client needed window lettering replaced very quickly and Jonathan was all over it. He did solid work in record time. This company was a great find. I highly recommend them. Black Parrot Sign Studio is absolutely amazing! Their work is awesome and their employees are the best! Craig is great and worked closely with me until my signs were perfect. We had Jonathan come to our office to install our Logo and wall quotes and he was very professional, worked quickly, and was so nice. Everyone has been a pleasure to work with at Black Parrot Signs. We will definitely recommend and use them again in the future! Words cannot express how thankful I am for the work that Bill and his team did on my latest project. They went above and beyond to make sure the project was completed on time and was great with communication and updates throughout. Thank you for everything guys and can't wait for the next one!! The vehicles turned out great and I will return as a customer soon. I was totally impressed with their ideas, price, and overall client service. I'm opening a new record store in Orange and I contacted Jonathan at Black Parrot Sign Studio to see what they could do for me. I was totally impressed with their ideas, price, and overall client service.Just like Jonathan, Bill is a fantastic guy and a total pro! Craig, their in-house designer, really opened up my eyes to a logo that is way more in-tune with my original vision.I really can't say enough about the team at Black Parrot. They're the best. Did an awesome job on our signs for our two locations. All the guys including Jonathan Craig and Bill are easy to work with. They communicated with me via email from start to finish. Black Parrot Sign Studio is amazing! I was in need of tear drop flags for my business in Santa Ana, and Black Parrot was perfect from placing the order to delivery. The turn-around time was only a few days to produce 3 13' flags, and they came out flawless. The price was less than I had expected it to be, and they look awesome. I know they are the perfect addition to marketing our business. Thank you Bill and the Black Parrot team! Black Parrot did a great job with our new signage. Black Parrot did a great job with our new signage. They listened to what we wanted and exceeded our expectations. Really enjoy working with the Black Parrot team! Really enjoy working with the Black Parrot team! Craig is very understanding of what his clients are looking for and delivers a great product. Jonathan is very pleasant and will work to accommodate schedules to make sure projects are executed in a timely and precise fashion. I look forward to continuing to work with Black Parrot! Completely nailed it with the design I wanted. What a great experience! I contacted these guys after viewing their yelp page...I'm glad I did! 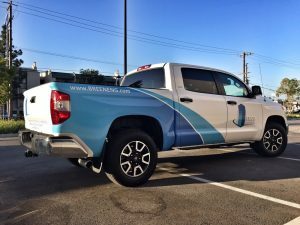 From start to finish they got my truck wrapped in a very timely manner, and were extremely professional throughout the whole process. Craig the design guy completely nailed it with the design I wanted. John, Bill and Craig all communicated with me the whole time! Great bunch of guys! You wont go wrong with choosing these guys for a vehicle wrap. Thank you Black Parrot Design! Bill & Tammy, Jonathan, and everyone we've encountered at Black Parrot Sign Studio are fantastic! We needed to replace two large signs at our swim school. They came out to see where they would be placed, took our logo and created two versions of the new signs--one to be viewed by drivers by, and one inside where pictures at events are often taken. They even photo shopped people in front of the indoor sign so we could see how pictures would look! At every step of the way, they went above and beyond. They even made a special trip to install before our big water safety day event. Once they were installed, we were blown away by the special touches their graphic designer had made to make the graphics actually look 3D! Couldn't be happier and will be returning for more signs in the near future. Black Parrot took a couple of pictures I had and blew them up WALL SIZE. I love the feeling of being in Boston or on the 12th hole at Augusta National. They also did my front entry way sign and it looks amazing.Craig, Jonathan, Bill and Tammy were professional through the whole process. Thanks again for the great work. The President of my company asked me to find someone to wrap our office doors in black vinyl. After a quick Google search, I found Black Parrot Signs. They had great reviews on Yelp and after a very pleasant phone call and an estimate, I decided to hire them. Even though this was an odd job for them, the end results were so amazing! They did such great work on this project that they put to shame the previous company we hired to do our other office suite. Also, the continual customer service provided by Jon and his team was absolutely exceptional! I highly recommend working with Black Parrot Signs! Thank you guys so much! 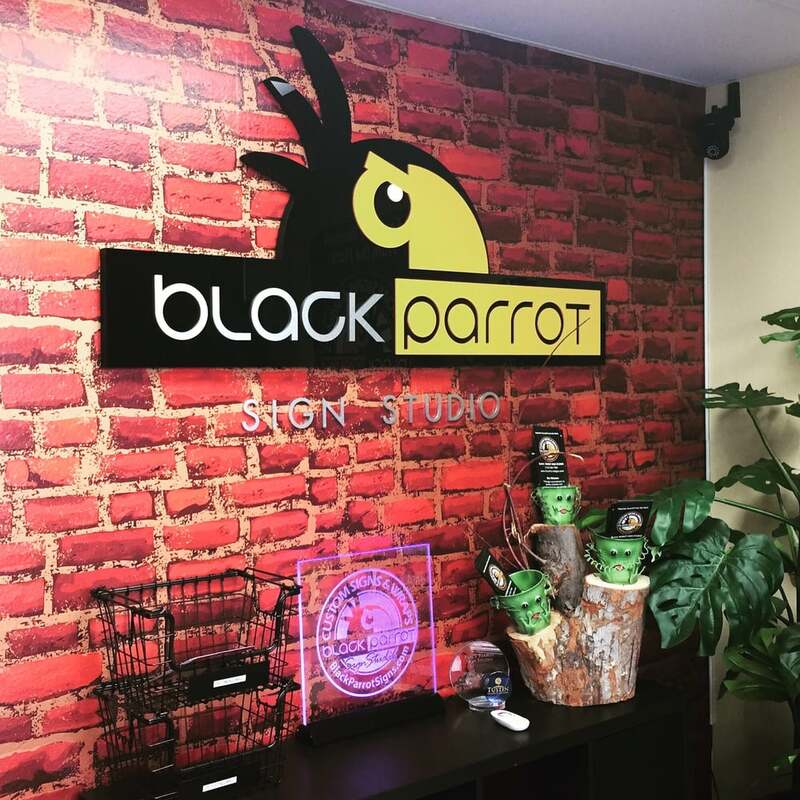 Every employee that I interacted with at Black Parrot Sign Studio was professional, knowledgeable in their specialty, and provided great customer service. Our company needed a large interior wall sign, 2 large decals, and a desktop acrylic sign made and installed for our rebranding. Jonathan Johnson made a great impression from the beginning when he emailed a detailed quote within a couple hours of first speaking with him and their prices were great (I got several quotes and part of the reason I chose Black Parrot was not just their affordable price but also the fact that Jonathan was prompt, professional, and detailed). Craig Cummings did an amazing job ensuring we had the quality of artwork necessary to produce the great quality results we were looking for. Both Jonathan & Craig patiently and efficiently handled all my change requests for sizes, materials, etc. and assisted me in getting exactly what I needed/wanted. Less than two weeks after placing my order, my signs were fabricated and installed in our offices. Jonathan also handled installation and was amazing as usual! He made sure everything was perfect and our new signs look absolutely stunning! My bosses were so impressed because the signs turned out better than they could have imagined so I'm very grateful to everyone involved in the fabrication of our signs at their sign shop. Black Parrot Sign Studio is the epitome of stellar quality, excellent value, and superior customer service. I met with Craig to review the design of my project. His enthusiasm is contagious. He took ownership off the project with a zeal that made me feel he had a vested interest in my success. Bill worked with me on my budget, even giving me a ride home so I could leave my vehicle there for a quick turn around. I left on vacation and, after reviewing several proofs, returned to see my beautifully wrapped vehicle waiting for me. A wonderful experience! These guys are the best in town! These guys are the best in town! Extremely helpful, with an emphasis on EXTREMELY. 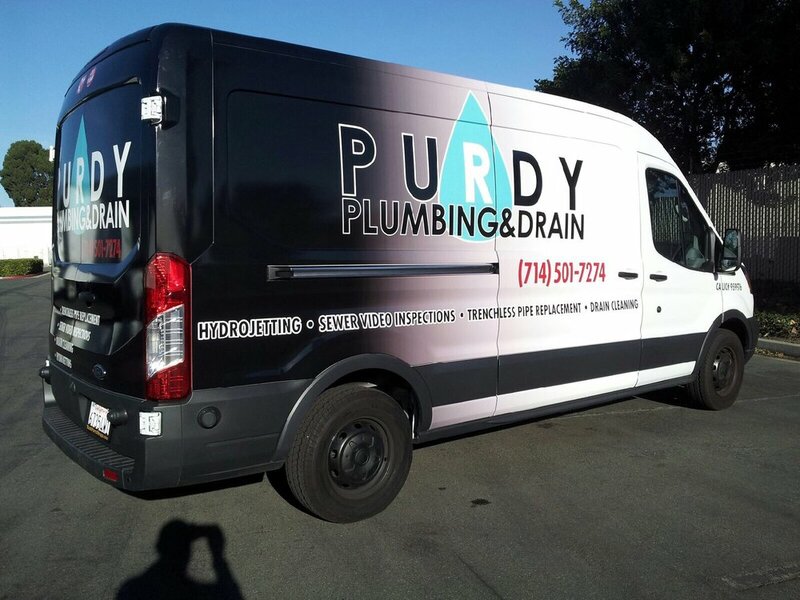 The entire team helped me on accomplishing a "black on black look" for our new van wrap. They provided preproduction samples so we could easily select the color we were looking to accomplish, plus walked me through on any questions or concerns I had. Bill, Craig and Jonathan were absolutely awesome in customer service and I would highly recommend them for any van wrap project, you wont regret it. Johnathon and his team at Black Parrot went above and beyond to earn our business. We were looking for a basic van-wrap for our coffee company and found plenty of options in the OC area, but only one company worked hard to get back to us in a timely manner, provide competitive pricing, and remain flexible throughout our completion process to work with us and our availability (which was slim!). The result came out beautiful and professional, and we even received a follow up call and email from Johnathon to ensure that his company met our satisfaction. Highly recommend working with Black Parrot! I can't say enough about this company. 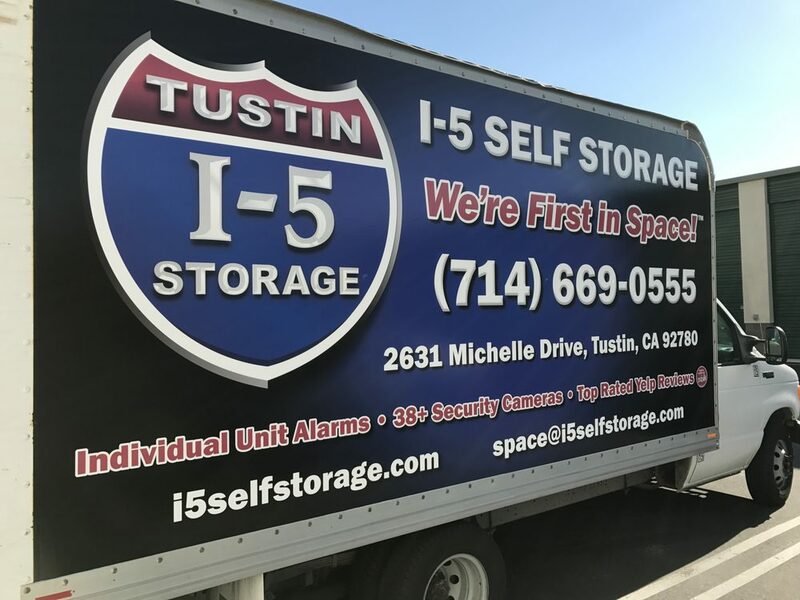 I have been looking for a good sign company in Tustin and we found it. Bill and his staff are so professional. Got our new sign today and it was so much more than we expected. I highly recommend Black Parrot Signs! Great prices, even better service! I will send as many people here as I can. Was on time and very nice. I bought a lobby sign for our new office building in norcal and black parrot signs installed for us. Jonathan is the absolute best. I am so impressed with the customer service. He was on time and very nice. When I had a problem with the sign he came back the same day I called him. Highly recommended! Great job guys! The entire team at Black Parrot, from Bill, Craig and Jonathan are awesome! The sign they had designed for our lobby turned out so nice, actually better than the proof! Can't wait for the other signs to go up in our building. This team delivers fast, efficient and professional work and will make it happen! Thank you! I have to say that these guys are very professional and provide the utmost care! Jonathan especially went above and beyond to help me with some work I needed done on my rims. I very happy with their excellence in customer service and recommend this company to anyone! Now I've had the time of my life, no I never felt like this before, yes I swear it's the truth and I owe it all to you.These guys are unreal. I came in with a totally ludicrous project that needed at least 3 weeks to complete and these guys stayed late AND worked after hours on weekends to help get my ridiculous job done in 3 days!! These guys deserve all the recognition and accolades they're given by the City of Tustin and Orange County for not only the incredible work that they do, but for the teamwork meeting insane deadlines in time. No one in the area was even able to entertain these demands, but Black Parrot accomplished it all with no problem. Bill is the freaking man, and Craig is a certified magician with his skills. I can't thank these guys enough. You would be settling for second best if you went anywhere else, trust me this isn't my first rodeo. Black Parrot produced the lawn signs and banners for Tustin Lobsterfest. Delivery was quick and Bill, the owner personally delivered them to the club within days of placing the order. Price was competitive with past suppliers out of state. It is great to find a local business that is this responsive and competitive too! Great job making top quality signs for my office. Jonathan has to be the nicest guy in the sign business. The whole team over there did a great job making top quality signs for my office and he went out of his way to put up miscellaneous signs here and there since I just moved offices. You may need to be patient with them but I can understand why they are busy because their customer service is top notch. I'll be using them for all my future sign need from them from now on. Highly recommended! So far we've had 2 of our work vehicles wrapped here and they look awesome! Craig is great to work with also. We went back and forth revising the artwork for our vans and he was so patient and answered all of our questions. We'll be bringing the rest of our fleet here in the future. These guys are good! I can not speak highly enough of Jonathan and the Black Parrot Sign team!! From initial contact all the way through to installation they have been extremely responsive and helpful. They are efficient, talented, and reasonably priced.I am a relatively particular customer and can honestly say that I have nothing but compliments for Jonathan and Black Parrot. Working with them has been an absolute pleasure and our new signs look FANTASTIC! !Thank you Black Parrot team for everything! Oh my goodness these guys are so nice! All about costumer service.They even added an extra sticker on my steering wheel for free! 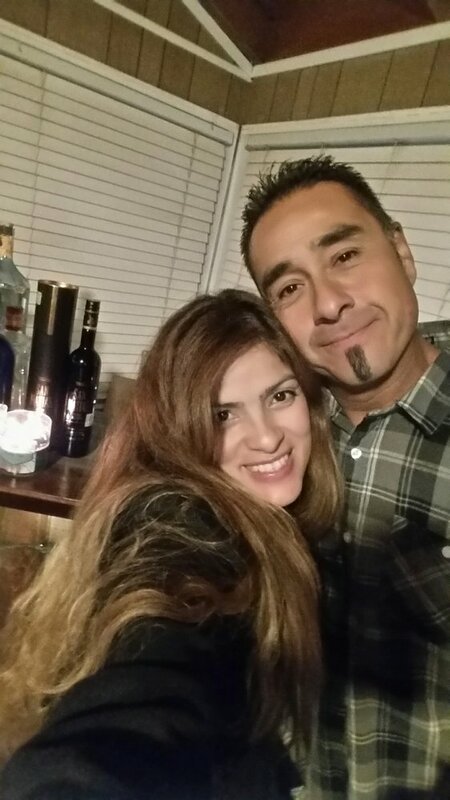 Very responsive and we can all have a good laugh each time we talk.I Highly recommend themI will not use any other service From the get go they were transparent with me. At first I went through gator wraps and realized that would have been a mistake, it's worth the consolation! High quality signage from the best sign company in Tustin. Get your custom business signs done by them and you will never look back. 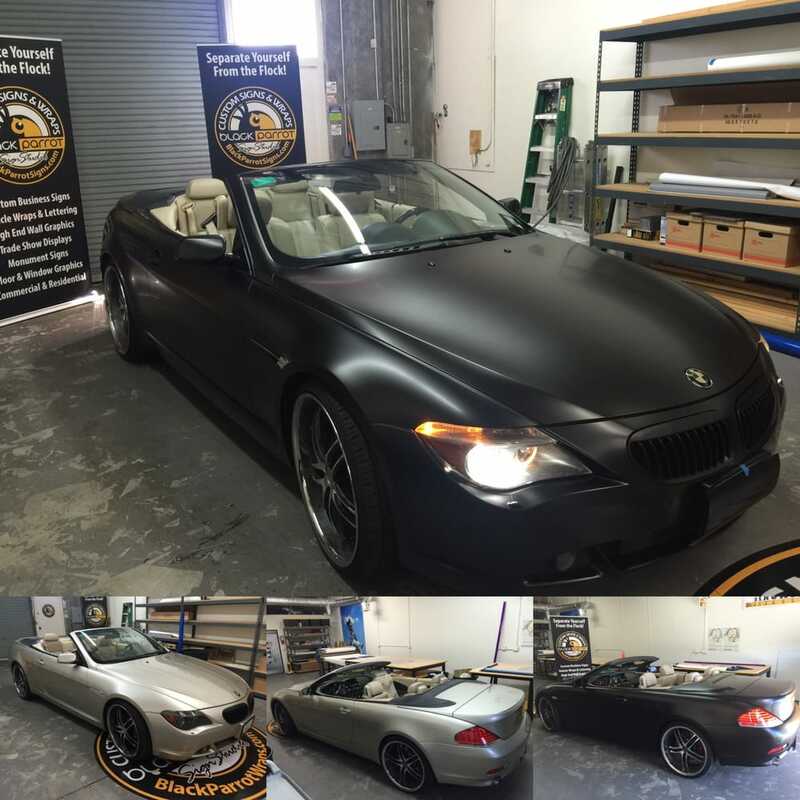 Our company has been using Black Parrot for several years now for all our signage and vehicle wraps and they never disappoint. The most professional company around and the quality is fantastic! We look forward to many more projects in the future. A huge thank you to Johnathan, Craig & Bill. Bill and his team are top notch! They do amazing work and are very detailed oriented. Communication and service was first class. I highly recommend them if your looking for any type of signage needs! Best in town. This is a great sign shop to get banners and other graphics printed out in Orange County.